Commercial-sized diamonds (+0.85 mm) recovered from the Kahuna kimberlite near Rankin Inlet, Nunavut. Source: Dunnedin Ventures Inc.
Dunnedin Ventures Inc. [DVI-TSXV] reported the its first diamond recovery results from the Kahuna kimberlite near Rankin Inlet, Nunavut, northern Canada. The 144.44-kg sample of Kahuna returned 13 commercial-sized stones (+0.85 mm) totalling 0.334 carats, for a sample grade of 2.32 carats/tonne. The largest recovered diamond was a 0.12 carat clear and colourless twinned octahedral stone. There were 87 diamonds recovered in total. Most of the Kahuna diamonds recovered by Dunnedin are clear and colourless variants of octahedra. The Kahuna sample was treated through an autogenous mill-fusion circuit located at CF Mineral Research, Kelowna, British Columbia, using a lower size cut-off of 0.425 mm. Unlike standard DMS recovery methods, the circuit can recover nearly all diamonds present in a kimberlite sample to the predetermined cut-off size, along with associated indicator minerals. Dunnedin is now recovering diamonds and indicator minerals from a series of kimberlite and till samples collected during two field seasons. 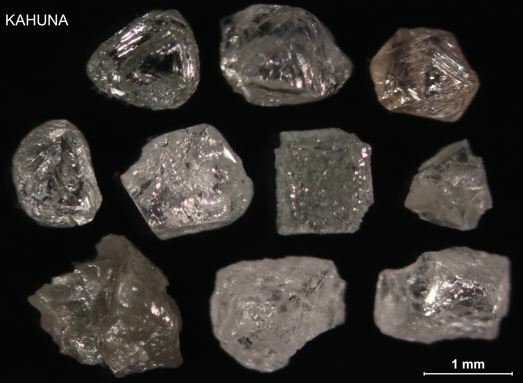 An inferred resource showed over 4 million carats of macrodiamonds (+0.85 mm) grading 1.01 carats/tonne had been defined along the partial strike length of the Kahuna and Notch kimberlite dikes through shallow drilling. The largest diamond recovered was a 5.43-carat stone from the Kahuna dike which was a piece of a larger diamond that had been broken during the sample preparation process and was reconstructed as having an original size of 13.42 carats.